Our mission is to provide a safe, non-intimidating yoga experience following the guidelines of BKS Iyengar. Kim and Russ Imlay have been married since 1985 and have three children. Kim’s credentials include CIYT (Ceritifed Iyengar Yoga Teacher) and IAYT (International Association of Yoga Therapists). She was introduced to Iyengar Yoga during her first pregnancy at the age of 18, then stopped practicing Yoga to become a full-time mother to their daughter that was born with special needs. Remembering the benefits of Yoga, Kim went back to Yoga when she was pregnant with their second daughter. Once again, life stood in the way of Yoga practice and it wasn’t until their third daughter was two years old that Kim returned to Iyengar Yoga classes at San Diego Yoga Studio. She never looked back. Kim began cleaning the studio in trade for classes and eventually became the SDYS office manager. She became a Certified Iyengar Yoga Teacher in 2003. While Kim was juggling family, studying and teaching yoga classes, Russ worked full time in a surfboard factory and would surf when he could. Russ had no interest in yoga at that time. At the age of 40 Russ had back problems that were interfering with the sport he loves, surfing and was feeling the stresses of life. He noticed a change in Kim and in the people in the yoga community; they were less stressed and physically fit. That’s when he began taking Yoga classes at San Diego Yoga Studio and becoming proficient in his practice. Russ began teaching by accident. A substitute was needed and Russ was the man for the job. He has been teaching ever since. Kim and Russ purchased San Diego Yoga Studio in 2006, marking the beginning of their Yoga careers together. They believe that Yoga has become infused into all aspects their lives and keeps them healthy – mind, body and soul. They truly thank Mr. BKS Iyengar for his teaching. Students are talking about us! I have been practicing Iyengar yoga since 1994. There was an extended time when for one reason or another I did not practice at a studio, with a teacher. My home practice was minimal at best. Although I continued at home, I started to have issues with back, neck, shoulders and …… as I aged. My neck got so bad I feared I would no longer be able to ride my bike. Having tried a chiropractor in the past I know this type of treatment was not suited to me. I went to physical therapy and at the same time started back taking classes at the San Diego Yoga Studio. I noticed improvements through going to yoga class and not much with the physical therapy exercises. I dropped PT and continued yoga, increasing my home practice and the number of classes per week. After about 2 years of a committed practice I noticed an increased awareness in body and mind, while getting stronger and more flexible. Iyengar yoga is giving me a better quality of life. It is something I know I can and will continue for my body, mind and soul. I am so grateful that the San Diego Yoga studio remains available to me and others. Thank you, Kim and Russ. When I was searching for a yoga studio several years ago, I only knew I wanted an Iyengar studio, but I knew very little about yoga. I’m so grateful to have found San Diego Yoga Studio. 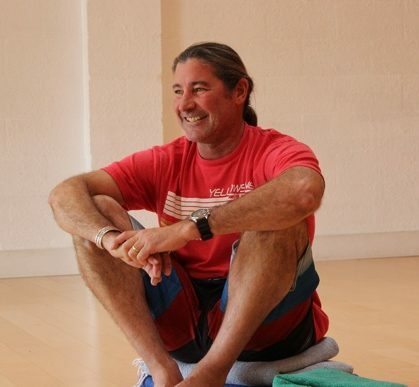 The owners of San Diego Yoga Studio, Russ and Kim Imlay, are premier instructors committed to coaching each student’s understanding of how yoga impacts their well-being. I have learned an incredible amount from them – about what is Iyengar yoga, what it means to practice, and how yoga impacts my daily life. In fact, my family has told me that I’m a happier person after yoga practice and my chiropractor says he does not need to see me anymore (since practicing yoga regularly)! Kim is, patient, a certified expert instructor and excellent at building each class to safely strengthen and expand your body movement range while helping you tweak and challenge your poses. She shares reminders that I “hear” in my home practice. Also, I really appreciate that San Diego Yoga Studio offers specialty classes (e.g., inversions, yoga studies, ropes). At the inversion classes, Russ has a wonderful ability to make the poses seem doable and has helped me gain confidence with my inversion poses. I strongly recommend San Diego Yoga Studio to anyone interested in learning more about yoga regardless of level of experience.